Perhaps more properly a satirist than a science fiction writer – Kurt Vonnegut was one of the most popular writers of the 1960s, and was called by some the “voice of the counterculture”. Over a long career, Vonnegut used every means at his disposal to get his moral and philosophical points across to his audience, and he employed conventions and settings from science fiction in many of his novels to do just this. As a young man, Vonnegut was a soldier in the U.S. Army during World War II. Returning home on leave from the army to visit his mother for Mother’s Day weekend in May of 1944, he found that his mother had committed suicide the night before he arrived. In December 1944 he fought in the Battle of the Bulge, was taken prisoner by the Germans, and taken to a POW camp near Dresden. He was present during the firebombing of Dresden in February 1945, which became the basis of his best-selling novel Slaughterhouse Five (1969). These experiences influenced Vonnegut profoundly. He writes in a purposefully simplistic style. 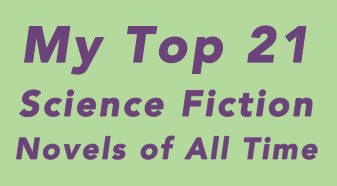 The situations encountered by his characters are often darkly comic and satirical, and many of the science fiction elements of his stories bring a sense of the bizarre or the absurd that heightens the existential crises faced by his characters. 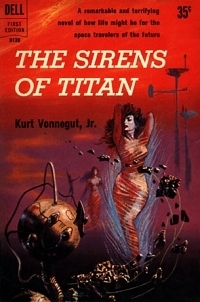 The Sirens of Titan explores typical Vonnegut themes like free will and the purpose of human life in a future interplanetary setting that shifts from Earth to Mars, Mercury, and Titan, and includes among its characters the richest man in America, a robot from a distant galaxy, and a space traveler who can predict the future – it’s a darkly entertaining introduction to Vonnegut’s style and oeuvre.